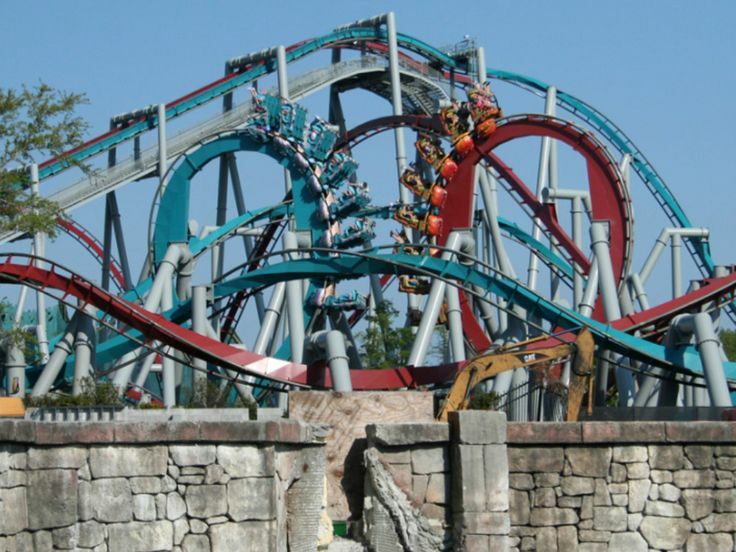 Dragon Challenge Closes in September. New Coaster to Replace it! In a surprise announcement today Universal Studios said on their official blog that the iconic Dragon Challenge roller coasters will close for good on September 5th. Well this has been predicted for quite some time it is still undoubtedly came as a shock for fans of this attraction. While the rumor of Dragon Challenge’s closure has been buzzing around for a while, not many people expected the closure to be announced this soon. However, considering that fellow Orlando resort Disney World announced several major attractions just weeks ago, it’s clear that Universal wants to one-up the competition. 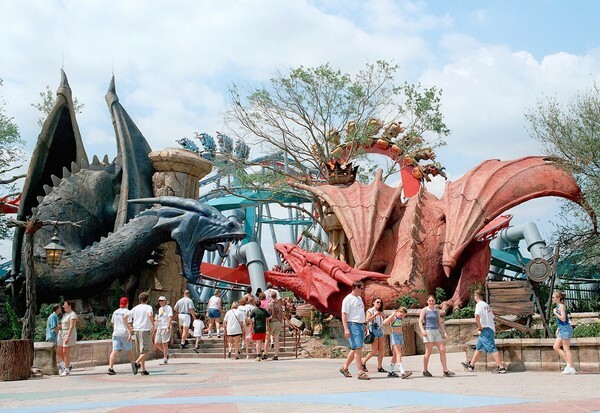 Originally opening in 1999 as Dueling Dragons, this ride experience was quite innovative for its time. It featured two B&M inverts named Fire and Ice with awesome dragon-shaped trains going head to head. However, in 2011, the park stopped dueling these coasters after several instances of park guest being hit with flying objects from the other train. The incident that sealed this rights fate occurred when a fifty-two-year-old part guess lost his eyeball after being hit in the face with an unknown object. Comments made by the law firm representing the man implied that it was a penny. Naturally, if something as small as a penny could cost someone an eye, these coasters were deemed too much of a liability to keep dueling. In the years following this incident, Universal installed metal detectors in the queue line. While lawyers said that this was a step in the right direction, it’s clear that it wasn’t enough to have the dragons duel again. So after the removal of such a major attraction, what will replace it now? Well, while the park will be losing two coasters, it’s at least going to gain another one. Universal confirmed earlier today that Dragon challenges replacement would be quote ” one of the most highly-themed coaster experiences we’ve created. It will combine a new level of storytelling with an action-packed adventure…and a few surprises along the way.” Universal didn’t give many details about what kind of coaster it would be, but a popular rumor going around is a Mack Powered coaster. Something like Arthur at Europa Park. This is a family coaster that lends itself to heavy theming, which fits the few details given on Universal’s blog. I feel a rumor going around it’s a Mack powered coaster something like Arthur at Europa Park. This is a family coaster that lends itself to heavy theming which fits the few details given Universal’s blog. In addition, it’s rumored that the ride will be theme to the Forbidden Forest. Either way, Universal implied that it would be fun for the whole family. 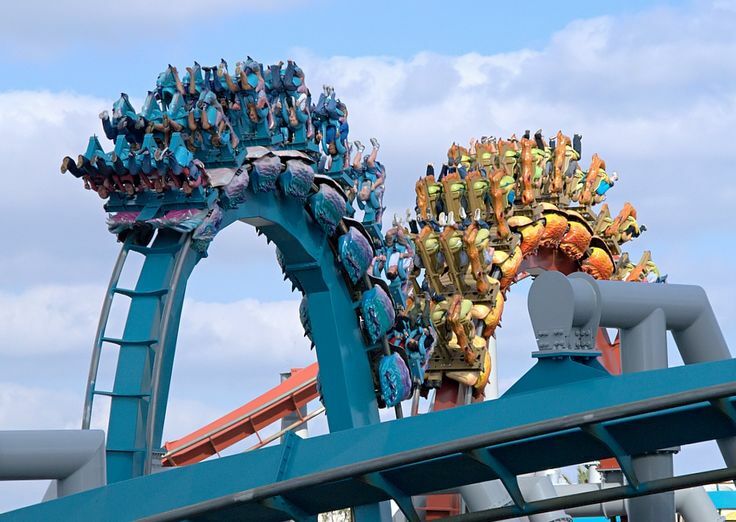 The idea of taking two major thrill rides like Dragon Challenge and replacing them with the family ride is a bit odd, and it’s always unfortunate to see a coaster bite the dust. At the same time though, we could be in for something really special. Escape from Gringotts and Forbidden Journey are fantastic, and despite universal’s recent reliance on screen-based motion simulators there’s always room for innovation. 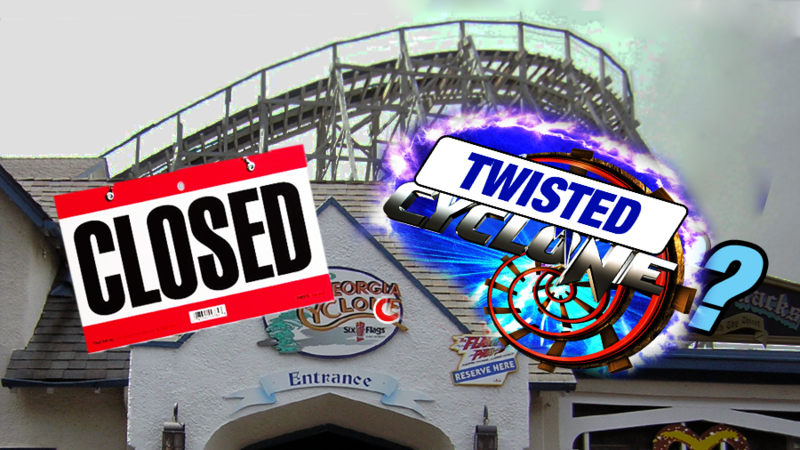 Georgia Cyclone to Close on July 30th. RMC Makeover Next? Originally manufactured by the Dinn Corporation, this wooden coaster first opened in 1990. It is a mirror image of the famous Coney Island Cyclone in Brooklyn, New York, but unlike that coaster, this one hasn’t exactly aged well. That’s why Rocky Mountain Construction installed topper track to 30% of the ride’s layout in 2012 to make for a better ride experience. However, it’s clear that Six Flags is interested in replacing it with something bigger and better. 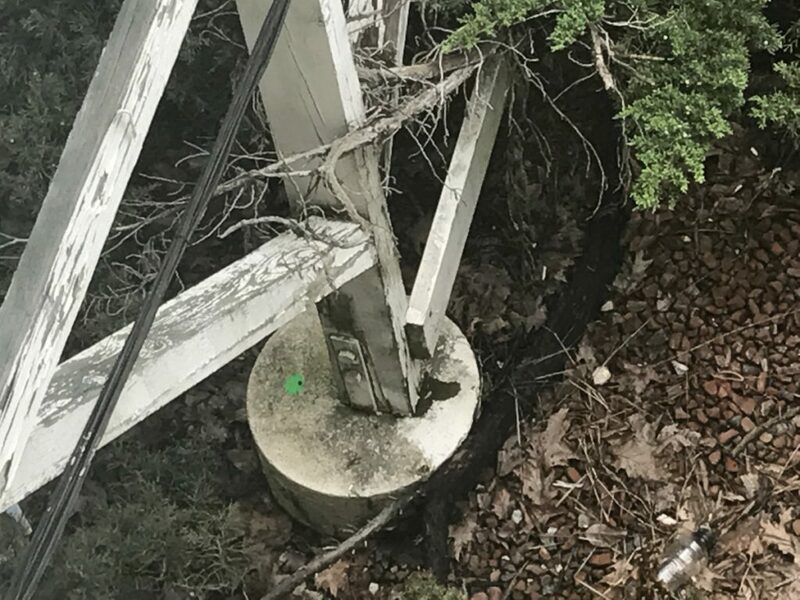 Earlier this year, construction markers were found on the coaster’s footers, leading many to speculate the ride’s future. Considering Six Flags’ recent additions over the years, it’s almost certain that this ride is about to get the RMC I-Box treatment. Ever since the New Texas Giant opened in 2011, Six Flags has given the Iron Horse treatment to six different roller coasters, and pretty much made Rocky Mountain Construction the industry giant it is today. 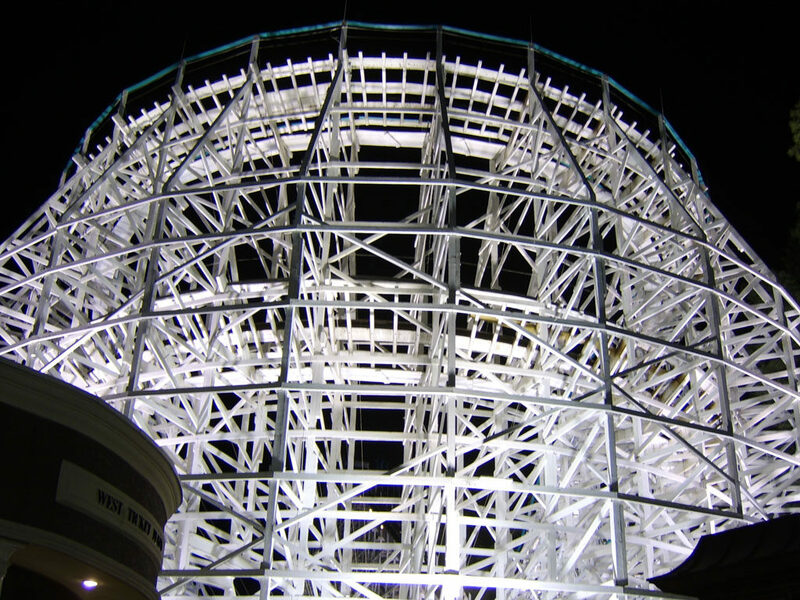 The Georgia Cyclone could very well be the next A-list attraction to come to the Six Flags chain. At this point, an RMC Georgia Cyclone is pretty much confirmed, there are still a few unanswered questions regarding it. First of all, what will it be named and themed to? Although Six Flags has the habit of re-using ride names like Goliath and The Joker, Six Flags Over Georgia already has rides with these names. One is a B&M Hyper named Goliath, and the other is a Larson Superloop named Joker: Chaos Coaster. So what will this ride be named? Well it’s location in the park is completely opposite to the Gotham City area, so even if they didn’t have a ride named the Joker, it wouldn’t really make sense to put it here. In fact, the area of the park that the Georgia Cyclone is in doesn’t really have a theme. Back in 2015, the old Cyclone roller coaster at Six Flags New England was re-named Wicked Cyclone when it got the hybrid treatment. Therefore, I’m going to make a pretty bold prediction and guess that this new ride will be named Twisted Cyclone. This name would be especially fitting if this ends up being one of Six Flags’ record breaking attractions for 2018. All this ride needs is four inversions to have the most out of every hybrid coaster, so a name like Twisted Cyclone would certainly be fitting. Whether or not this ends up being the case is still unknown, but once Six Flags makes their announcements in September, we’ll all find out. World’s Tallest Drop Tower Coming to Miami in 2020! While Miami is more known for its beaches than its thrill rides, that’s all about to change in 2020. 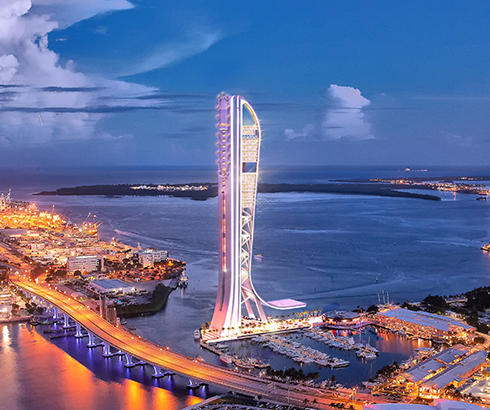 The upcoming Skyrise Miami entertainment center is set to feature SkyDrop: the world’s tallest and fastest drop tower. It will be a massive 540 feet tall and have a top speed of 95 miles per hour. This will make it 125 feet taller and five miles per hour faster than the current record-holder Zumanjaro at Six Flags Great Adventure. Interestingly enough, the project’s official website features footage of both Zumanjaro and Lex Luthor Drop of Doom, hinting that this tower will also be built by Intamin. 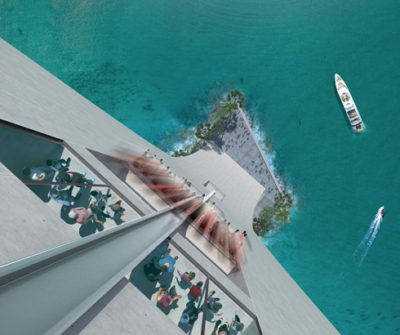 SkyDrop itself will be on the back of the building and will overlook the Atlantic ocean. It is sure to be one of the best views on any drop tower. For those of you unaware of this project, Skyrise Miami is an upcoming entertainment center in Miami Florida that is currently under construction at the Bayside Marketplace. It was first proposed in 2013 and was recently approved for construction last December. It will be the tallest building in Miami and is scheduled to open in 2020, the same year that the Superbowl will come to the city. 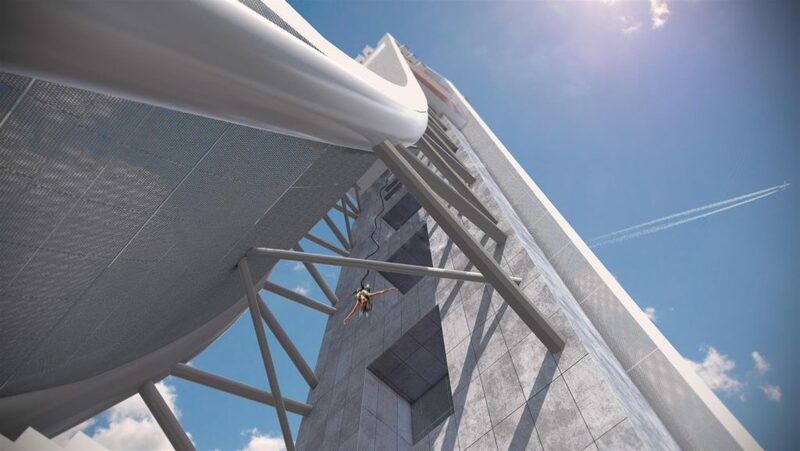 In addition to SkyDrop, Skyrise Miami will feature a bungee jump experience, several observation decks, fine dining, a nightclub, a 4D motion simulator, and much more. It’s sure to be a prime location for thrill seekers and tourists in general. Whether or not this will open by 2020 is unknown, but unlike the long-awaited polercoaster, at least this project made it to the construction faze, so there’s a good chance it will end up opening. 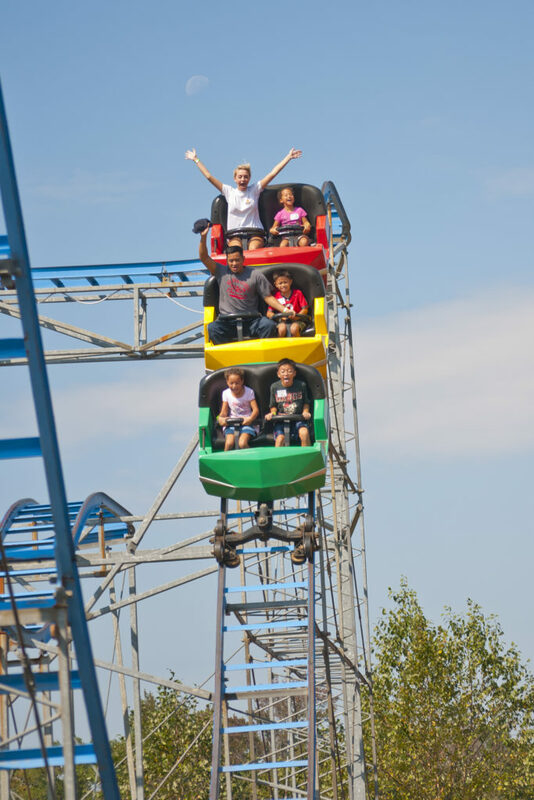 Fun Spot may not be the biggest or most nationally-known amusement park chain out there, but they certainly are a force to be reckoned with. Just weeks after the opening of their impressive new Gravity Group woodie Mine Blower, the chain announced that they would be buying another park to add to their roster. 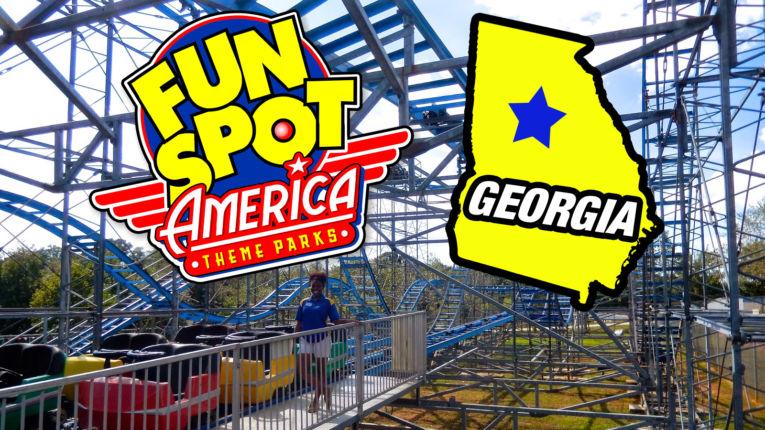 In addition to Fun Spot’s two Florida locations in Orlando and Kissimmee, the chain will now have a new location in Fayetteville, Georgia. Fun Junction USA, formerly known as Dixieland Fun Park, is a smaller theme park that’s about a half-hour away from Six Flags Over Georgia. This is just like how Fun Spot Orlando and Kissimmee are located close to bigger Florida parks like Disney World and Universal Studios. Also like Fun Spot’s other locations, Fun Junction has go-karts, bumper boats, and a few small flat rides. However, while the Fun Spot locations in Florida both have newly-built wooden roller coasters, the only coaster at Fun Junction is an E&F Miller Hi-Miller named Scream’n Eagle (not to be confused with the PTC woodie at Six Flags St. Louis). This ride is similar to a Schwarzkopf wildcat and was actually named Wildcat at its previous location at Nevada’s Wild Island. Considering that this is the only coaster at the park, would it be possible for Fun Spot to add an all new wooden coaster here? If this is the case, then we can expect the first Gravity Group woodie to come to Georgia. Though since the park was just recently acquired, we may not see a new coaster go there until Fun Spot decides how good of an investment it would be. Either way, it’s exciting to see a small chain like Fun Spot grow. I recently paid a visit to their Orlando location and was very impressed with the staff, the late hours, and of course, White Lightning itself. Hopefully they can bring the same excellent service to Georgia, it could very well end up being a hit with the locals.